Why does Star Wars speak to billions? Studio heads hated it. The actors thought it ridiculous. George Lucas feared catastrophe. Yet it became a spectacular success that appealed on many levels. Star Wars is a modern retelling of The Hero’s Journey, the universal tale of calling and fulfillment described by mythologist Joseph Campbell in The Hero with a Thousand Faces and later recounted in conversations with Bill Moyers to rapt PBS audiences. But at the time of the film’s release studio heads had no faith in it. The actors thought it was ridiculous. George Lucas feared catastrophe. And yet Star Wars became a success that appealed on multiple levels to billions worldwide. So convinced was the studio that Star Wars was going to be a dud that it only made fewer than 100 prints. The physical celluloids quickly wore out as crowd demand for the space opera soared. The film turned out to have deep psychological resonance across generations and cultures. Its bold assertion that evil exists didn’t deter fans. Nor did its claim that the choice between light and dark is fraught with obstacles. 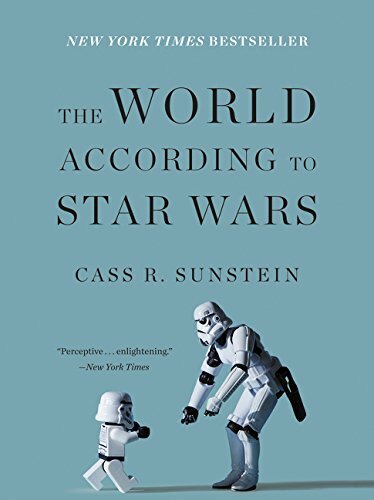 What Sunstein attempts throughout this book is to lay out the many lessons he thinks the film series can teach us today. Everyone can relate to the saga: Who am I? What am I about? Am I fulfilling my potential, and if not do I still have time to do so? Its plotlines challenge people like Han Solo who live their lives on autopilot. The questions they raise are potentially liberating. Merely asking them can change your perspective for good. A major lesson of the saga centers on disappointment when predictions about the future turn out wrong. “Difficult to see,” Yoda says, “always in motion is the future.” Hence the frequent failure of authoritarian machinations here on earth or government planning in general (think Obamacare). Unintended consequences lurk everywhere. For grudge holders: If Luke can forgive his father, then maybe you should let it go, too. Or look at how we follow the herd and are swayed by what others like. Accident, contingency, and the whims of the mob manipulate us more than we care to admit. The films admit that almost everyone has pivotal “I am your father” moments when the familiar world changes along with everything we had assumed. It shows how democracies willfully turn themselves over to dictators––something evident in today’s global politics. It shows the conditions that allow dictators to rise to power and how the governed easily fall prey to them. While the film is open to diverse interpretations, Sunstein doesn’t always succeed in tying speculations to pressing modern questions. The film’s real topic, he argues, isn’t destiny or evil but the fork in the road, the split-second decisions we must all make. Momentous pivots when life changes directions are a consequence of free will rather than destiny, he says. The freedom to choose is equally the responsibility that we must choose. And we should know that the Jedi mind trick isn’t so special. We know already from behavioral economics and psychology how easy it is to manipulate people’s attention, frame the way they see things, and get them to do what you want. And so we need to pay attention and be on guard. Because attention flows like water and can be channeled and diverted, we need to remind ourselves that our limited bandwidth of attention makes us miss things in front of our eyes. As to faults, the book suffers from too many parenthetical comments and author asides. A larger fault is the habit of the publishing industry for overhyped blurbs. “This gem of a book . . .” “brilliant,” “irresistibly charming,” and other equivalents of a standing ovation. But it’s not. It’s a fun book that stretches too much to make connections from the films to modern life. Take it to the beach.